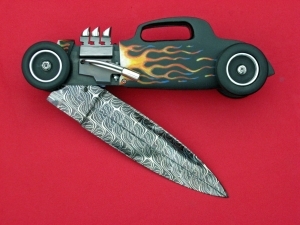 Like Hotrods and knives? Then this one is for you! Knife makers are cutting edge. They are always out there making what they like- and in some cases, what they hope buyers will like. Did you notice in the recent edition of Blade Mag the article Every Father’s Favorite? Had some nice knives, but one in particular shot right off the page when I saw it. Introducing Knife Maker Philip Booth’s The California Kid. Phil describes the Hotrod knife as a ’34 Ford profile. Sporting a 5″ damascus blade that is spring fired when the headers are pressed. If you like this check out his website. I’d say he likes Hotrods too. Hang around the knife industry for very long and you’ll no doubt hear a conversation about how boys today aren’t into pocket knives anymore. In fact, we here at CNJ have reported on more than one occasion that sentiment as well. Yes, while it is true times have changed and we can quickly come up with a list of reasons, as we have, why this is the case. Young people don’t need knives they way they did last century, right? Well, hold on to your horses there just a minute. This problem is not new to our society, nor our time. Listen to this statement as reported in the December 1930 edition of Paine’s Cutlery Journal. So, there is hope because pocket knives became a rite of passage for most every boy up until the mid-1970’s. On the other hand, there are lots of younger collectors out there- most of them just don’t carry the traditional pocket knife anymore, but they are definitely into knives just the same. PS: Check out “Knife Collections” on YouTube to find over 6000 vids. Many of these collections are owned by the younger generation too. Are you a User? Give a little bit! Knife collecting is all about knives, isn’t it? Well, yes and no. Today, we’re going to look at the people who make up the knife world. I have observed two types of knife people. Don’t know if they collect or not. Don’t know if they like new ones or old ones, or if they have an EDC or not, and it really doesn’t matter for the purposes of their introduction. The point about these knife people isn’t about the knives anyway. I’d like to introduce the two knife folks I see in our hobby. The first is the person I call “The User” and the other is “The Giver” (bet you thought I was going to say a Collector, didn’t ya?). The User is just that- a user. He takes. It’s the- what can I get from you or the situation that benefits me– perspective. It’s all about him. You don’t want to be a User. I see them everywhere. This person drains you and then is on his way. It is the knife seller who is only interested in relating to you as long as you are interested in one of his knives and when you aren’t, he is gone. This person exploits others. If you can’t do anything for the User, then the “relationship” offers no value to him. There is, on the other hand, this second person- The Giver. The Giver approaches another person or situation from the opposite direction. The Giver is a how can I help you person- without an ulterior motive. The Giver helps and shares. As too good to be true sounding as this person is, I see them all the time in our hobby. When you meet one of these people, you know it immediately. And yes, we will often think, “Now, I wonder what they want?”, but the fact remains, a Giver isn’t looking for anything from you. The Giver isn’t necessarily a knife expert. Instead, his approach isn’t about knowledge or facts anyway. It is about relating to you, or me. When you meet a Giver you will know it. On the other hand, when you meet a User- you’ll know it too, immediately. Givers are the good knife folks. Thanks to all who have given to me! Earlier this week, we reported Victorinox diversifying its product line by offering non-knife items, like perfume, watches and other personal items. 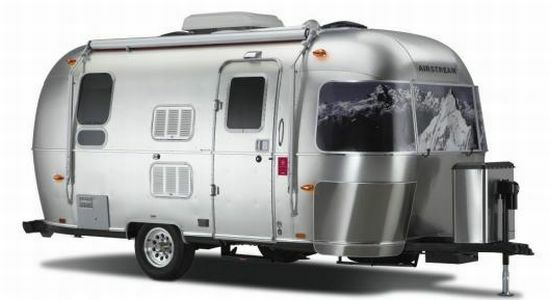 Now they are really stepping out with a joint venture with Airstream– maker of high-end recreational travel trailers. The two are now offering the ultimate knife guy’s toy- great for hitting the show circuit in. This special edition Airstream commemorates Victorinox’s 125 anniversary. It comes loaded- the Airstream way and is only a cool $59,000. I’m sure they are only offering this as a limited edition so better hurry to reserve yours today. Now there is no excuse for not taking the whole family on the road with you. 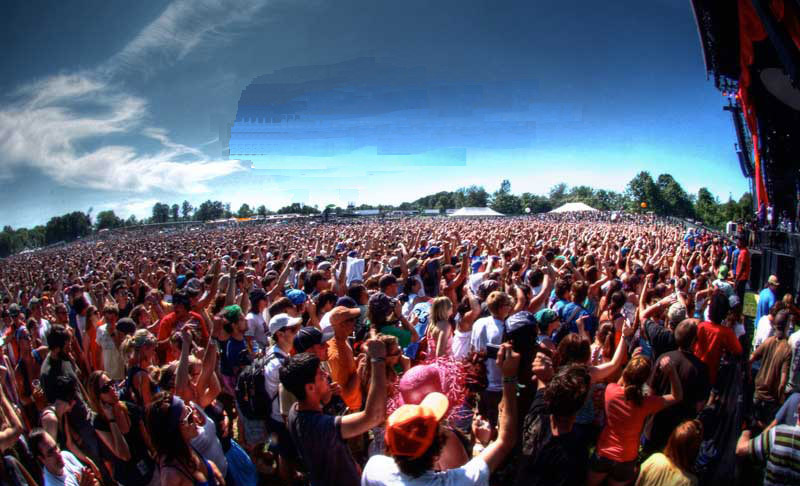 Just think, you will have it paid by saving on the hotel rooms for the shows- 789 nights stay at $75 per night room charge and you will have paid for this puppy. Sounds like a deal to me. This assumes you can park it somewhere for free and doesn’t include the extra gas you’d burn pulling it. OK, so most of us won’t live long enough to stay that many nights at shows, but my gracious, we can’t cost justify most of our knife purchases either and we bought them anyway :). Thanks to KC’s Tech blog for making us aware of this opportunity. What does a knife manufacturer whose brand is known worldwide do when times get tough? 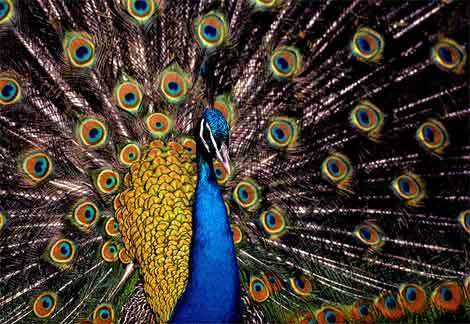 It diversifies. Victorinox, the 125 year old Swiss knife maker, is now offering watches, shirts and perfume to bolster profits. This old cutlery firm is the maker of the original Swiss Army Knife, first issued to the Swiss military in 1897. 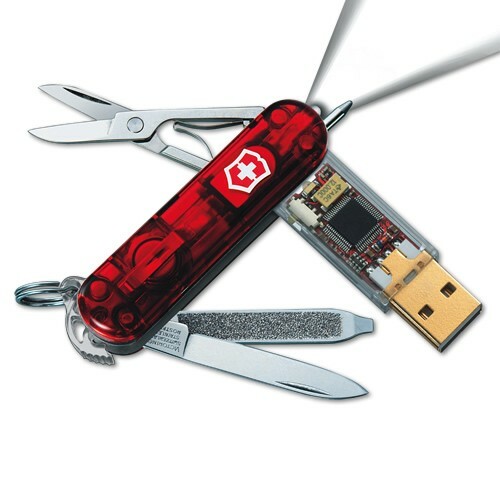 In an recent interview with Reuters News Service, Victorinox Chief Executive, Carl Elsner said the new product line is breathing new life into the brand. Two recent episodes- 9.11.2001 and the current credit crunch caused the firm to look outside cutlery for revenue by capitalizing on it brand’s recognition. The firm posted a net profit of $436 million in 2008 evidencing its recovery from the decline in its knife sales resulting from the war of terror, and then came the current “credit crunch.” Mr. Elsener said in his interview this year has been the hardest year in the history of Victorinox. Obviously this guy is not a member of iKnifeCollector’s EDC Club, we’d never be this dumb, or at least wouldn’t have let anyone know. Instead, we’d just limp off with a forced smile as we dripped a blood trail. 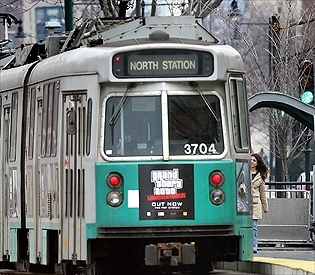 Here’s the story, as reported on the Boston Globe’s Boston.com– This morning a 29 year old man hopped on a Green Line trolley and when he sat down somehow his knife stabbed his leg. I’d be curious to know the details, but can report while the wound was serious, it wasn’t life threatening. That’s what a dude from the MBTA said. Emergency Medial Services personnel responded to help the wounded man, which caused the outbound trolleys to be delayed right in the middle of the morning commute. Talk about embarrassing. If someone can track this guy down, we’ll make him an honorary member of the EDC Club. I have a beef! Why can’t they let knife buyers know? I have a gripe today. I try very hard to be a positive person. I have only ranted about a gripe here at CNJ a couple of times and this is one. Today, I ran across an ad for a knife auction. It was a fair sized knife auction. 500 lots. It seems the auctioneer either didn’t want knife collectors bidding, or simply didn’t know how to inform us. I didn’t see the auction advertised anywhere in the knife world. No, I don’t mean Knife World Mag, but it includes that pub- I mean anywhere in the knife world. So much for target marketing. Now you may have seen the ad, but I didn’t and I read a lot of knife stuff. So, guess where I found the ad for this knife auction? It was in a pub this auctioneer probably uses to for all of their auctions, but it isn’t one that reaches the knife buyers, like Knife World, or even Blade. Heck, they could have posted it in a knife forum somewhere to say the least. Instead, the ad ran in Antique Week. Now how many knife collectors- not dealers- but collectors regularly read AW? Not me. I just happened to pick up a copy because a co-worker writes a column in it. Plus, the ad was in the May 4th edition. The auction date was May 9th. So much for giving the buyers time to get their ducks in a row and make plans to travel to Pennsylvania, wouldn’t you say? We live in the internet age too, don’t we? 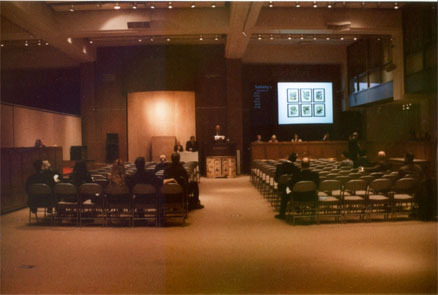 Would you believe me if this auction didn’t provide for remote bidding- online or proxy, or even phone bidding, which tells me the auctioneer is still back in the 1980s. Everything about the way this auction was handled gripes me, but it’s OK, cause I don’t need to buy more knives anyway- which is really good, because it seems they didn’t want us knife buyers bidding anyway. In the first post of this series, we discussed the number of survey participants and how the survey was promoted, along with the answer to the first question of the age of the participant. Today let’s look at the answers for the second question. Question #2- How many years have you collected knives? Interesting to note- Fifty-two percent of the collectors have collected 5 years or less, including a whopping 31% for 2 years or less. This chart clearly shows the future of knife collecting is very bright as an entire new generation of knife collectors are already actively enjoying this hobby. This trend is particularly pronounced when you look back at the age proportions of the collectors surveyed as revealed in Question #1. We have a whole new generation of collectors who have just recently started collecting knives as a hobby. It will be interesting to see if when these collectors are the old timers, whether or not the really old and sought-after vintage knives of that day will be the early tactical and survival knives they collected back when they first got started collecting. Let’s just say, I’d be willing to place a wager, if I thought I’d be around to collect on it. Thought I fell down a rabbit hole, did you? If you are a regular reader of CNJ, you know I intentionally don’t write about “personal” stuff, unless it is somewhat knife or collecting related. I must break my rule in order to tell you why I haven’t been writing to CNJ this week, plus share some exciting news. You all know I have a house-full of kids who are very sports oriented, well this week we have run all over the beautiful State of Alabama hitting sporting events. My middle daughter qualified for the State Track & Field Meet. Things started there. At the end of the contests, she WON FIRST PLACE in the 4X1, then went on to win 4th in both the 200 meter and the 4×400! My wife and I are very proud of her. At about the same time 7 hours away from the track meet my son was playing in the semi-finals for the State 2A baseball tournament. His team is young and only has one senior. He’s a jr. Last night they won the first game and lost the second. So, here in about 2 hours I’m headed to the third game to see which team makes the finals.